The article treats the problem of the application and choice of antibiotics when carrying our antimicrobial therapy in inflammatory diseases of the periodontium. Based on data obtained from the bacteriological test of the content of periodontal pockets, in 75% of the patients with generalized periodontitis with a different degree of severity, there are discovered aerobic – anaerobic – fungal associations with primarily obligate and facultative anaerobes. 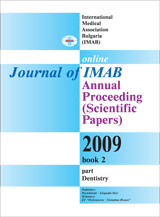 In view of the results from the determination of sensitivity of various bacterial strains to antibiotics of various classes, the most prospective preparation for the suppression of the growth of the whole specter of pathogenic flora, located in the periodontal pockets in patients with periodontitis, is Clindamycin MIP. The data about the high clinical and bacteriological efficiency of Clindamycin, obtained from the clinical and microbiological tests, give us grounds to recommend it in the complex treatment of severe forms of generalized periodontitis. Key words: antibiotic therapy, periodontitis, periodntium, clindamycin.